This comfortable decksaloon yacht from the famous Jeanneau yard has 2 spacious cabins. The owner's cabin in the stern has a centerlined bed with lots of lockers. The guest cabin is also spacious with its own head. 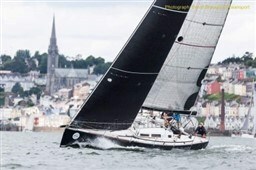 Plenty of privacy aboard this Jeanneau. Moreover, the ship is to sail single handed because of the furling mainsail and the electric winches. The cockpit and decks are fitted with glued teak. Because of the decksalon concept you have a lot of light and lots of storage space inside. Under the floor you have access to a deep bilge with storage boxes. Ideal for long stay on board. 2 spacious cabins each with its own wet cell. Possibly also 2 sleeping places in the saloon. The decksaloon concept gives you a sea of storage space under the floor. In 2015 new Raymarine electronics set with four new Raymarine I70 Multi displays. New Raymarine P70 display for autopilot and extra strong Evolution EV 400 drive. 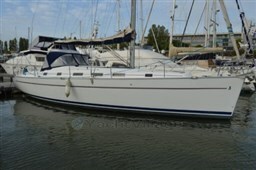 Dear Sirs, I have seen on YachtVillage your offer about Jeanneau Sun Odyssey 42 Ds - 2006 (code: 293346). I am interested in the offer and would like you to contact me. Thank you. If you would like to find out more about this boat and any other boats of this type and range, Digibusiness Srl,the Company that manages YachtVillage, and Jachtmakelaardij Kappers, the Company that exhibits the Boat, must necessarily acquire some simple details about you (name, surname, email address and, if needed, your telephone number). These details will be processed according to the purposes and means of the processing indicated in the privacy statement under the PRIVACY Section of this website, referred to herein.